The use of ordinary items as a reminder of God’s presence dates to the Old Testament in Numbers Chapter 15 when God offered the Israelites the fringe of their garments as a tool. Some may be surprised that beads may be used as a guide for prayer and a provide structure to extemporaneous prayer. Prayer beads can also help us to know what and how to pray as we let the structure of the prayer beads guide. The prayer beads are divided into 4 sections. You will notice that next to the cross is one big bead that is called the “Invitatory Bead.” This bead invites us to a journey of prayer. Then, you will notice that the prayer beads form a circle. In the circle, there are four big beads, with seven smaller beads in between. 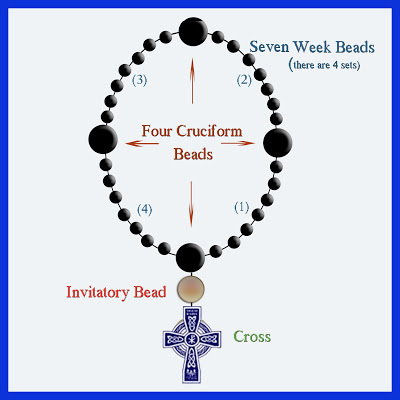 The four big beads create a cruciform shape to remind us of the four points of the cross. Four also reminds us of the four gospels, the four seasons of the year, and the four directions. The smaller set of 7 beads is also significant. Because a week has 7 days, these are called the week beads. Seven, of course, is a significant number for Christians. The church calendar has 7 seasons (Advent, Christmas, Epiphany, Lent, Easter, Pentecost, and Ordinary Time). There were seven days of creation and in the book of Revelation, John writes letters to seven churches. Both Jews and Christians believe that the number 7 symbolizes spiritual perfection. Invitatory bead: You have called me into this time of prayer to be with you. Week beads, set 1: Use each bead to praise God; think of different qualities of God for which you would want to give praise. Week beads, set 2: Use each bead to confess your sins to God. Week bead, set 3: Use each bead to list your intercessions — your joys and concerns for yourself or others. Week beads, set 4: Use each bead to offer thanks to God for the blessings in your life. Invitatory bead: Christ is alive in me. Thanks be to God.